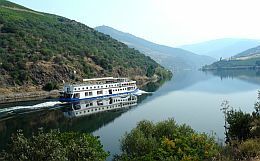 Take a Douro cruise from Oporto (Porto), Regua, Pinhao and Barca d'Alva past the Port Wine quintas for the highlight of your time in Portugal. 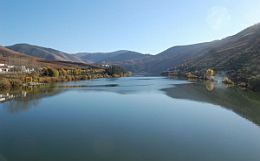 The Douro river rises in Spain where it is known as the Duero. As it becomes wider, it forms the border with Spain before turning west across the width of Portugal. 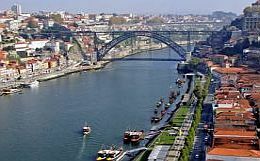 It is navigable from the Spanish border for the complete crossing of Portugal until it reaches the sea at Porto (Oporto) on the west coast. During its journey, the river passes the Port Wine quintas in a region of steeply terraced hills and mountains. In recent years, the river has been tamed by a series of dams and locks and no longer has the dangers of the rapids faced by men of former years. Porto City Break - Douro Cruise 50. Min. We thoroughly enjoyed the cruise to Regua. The commentary was very good and the crew friendly. We enjoyed the lunch very much and the atmosphere on board was excellent. The booking process was very easy and quick. We booked via internet 1 month in advance. We made the cruise on the 05 June 2015, Porto to Pinhao and then returned by train. Beautiful environment. Not much to see in Pinhao village. The cruise was most enjoyable and all the staff looked after us very well. The breakfast and lunch was very nice, the food and wine plentiful. I would recommend this trip to anyone.